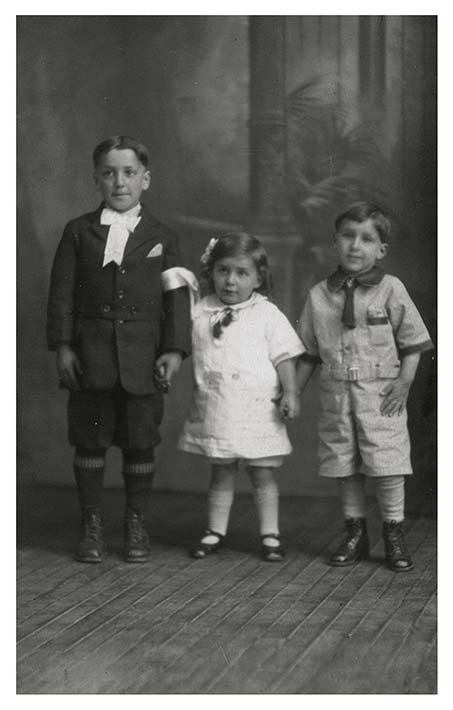 Photograph showing the the De Marco children in North Bay, ON. At the left, Anthony De Marco appears dressed for his Holy Communion. His sister Constance stands in the middle, and his brother Frank is standing at the far right. Given the children's appearance, this photograph was likely taken in the late 1920s. The photograph is formatted as a postcard. From the writing on the back, it seems it was never mailed. The Holy Communion is one of the seven sacraments of the Roman Catholic Church. In the Italian immigrant tradition, it is celebrated as a rite of passage, and often is an occassion for a large gathering of extended family and friends. About a decade later, the children's father Carmine De Marco would be arrested and interned as a threat to the Canadian state.